'Witty' (Paul Black, R. 2011) Seedling #Q58D. IB. 26" (66 cm). Early to midseason bloom. Standards butter yellow center with mid tan plicata veins, dots and rib, wide saddle tan band; style arms gold crest and ridge, ecru edges; falls mid yellow, hafts heavily sanded and veined mid chestnut, 3/4" tan band around lower 2/3, variable application of tan dotted plicata veins inside band and line from beard about halfway down; beards based white, tipped old gold; pronounced sweet fragrance. 'Blackberry Tease' X seedling #O292: (seedling #L223B: ('Brash' x 'Pink Frosting') x seedling #M254C: (seedling #J402B: (seedling #F252BB: ('Tweety Bird' x 'Oregold') x seedling #F227BB: ('Shy Violet' x 'Sigh')) x 'Amusing')). Mid America 2012. Honorable Mention 2015. From Mid-America Garden catalog, 2012: WITTY (Black ‘12) IB Early-Midseason 26” (66cm). Classic form and bright, healthy clumps filled with bloom. $24.00. 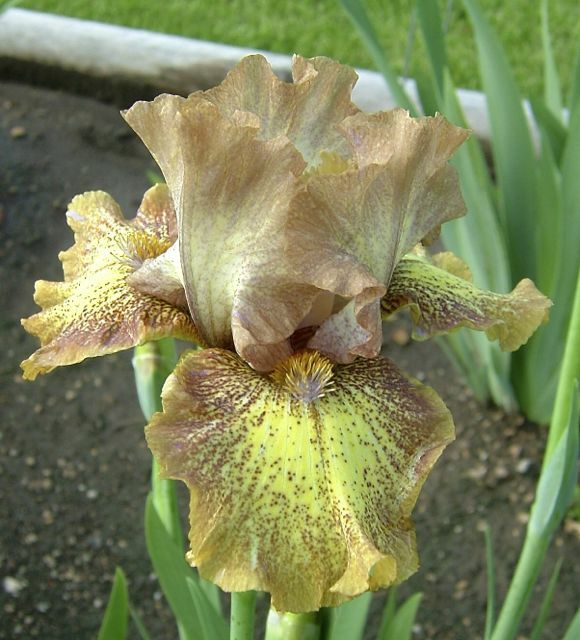 Hybridizer's Comment: Cream standards with wide mid brownish tan plicata bands. Bright yellow falls with brown plicata marked hafts blending to mid tan plicata bands. Classic form and bright, healthy clumps filled with bloom. jpg BHP_6200-X2_witty.jpg manage 90 K 10 May 2016 - 23:34 BrockHeilman Please contact Brock Heilman for image use.